Inspired by 8540tomg (despite his lack of interest in machine made snow piles) https://www.pentaxforums.com/forums/12-post-your-photos/251160-landscape-k2-everest.html , I took a little detour to capture the local mountains. It was snowing and grey, so lousy conditions for photos. But you can see what happened to parts of the parking lot which are quite clearly no parking zones right now. When the weather warms up, these will be some of the last areas to clear out. Last edited by MSL; 02-09-2014 at 02:31 PM. The first image was made by a "manly" snow blower. Not one of those wee walk behind jobbies. Are you sure they haven't lost a few cars under there? You can keep that snow! It looks far to cold for me! No, I'm not sure. There typically isn't overnight street parking or mall parking, especially in the snowy season. But cars are often left on the street at the wrong hours and can easily get plowed in or plowed over. Last week the bigger hazard was avoiding garbage cans and the like that had been scooped up by the plows and deposited at random on the roads. Tim the Tool Man would have a Farmall tractor belted to his snow blower. That would be a "manly" tool. Let's install a tow line and rent it out for skiing. OK. I'll stop complaining now. Here in Canada we celebrate this stuff Monochrome. It's no accident that hockey is our national sport. The rest of the smart people moved South long ago. 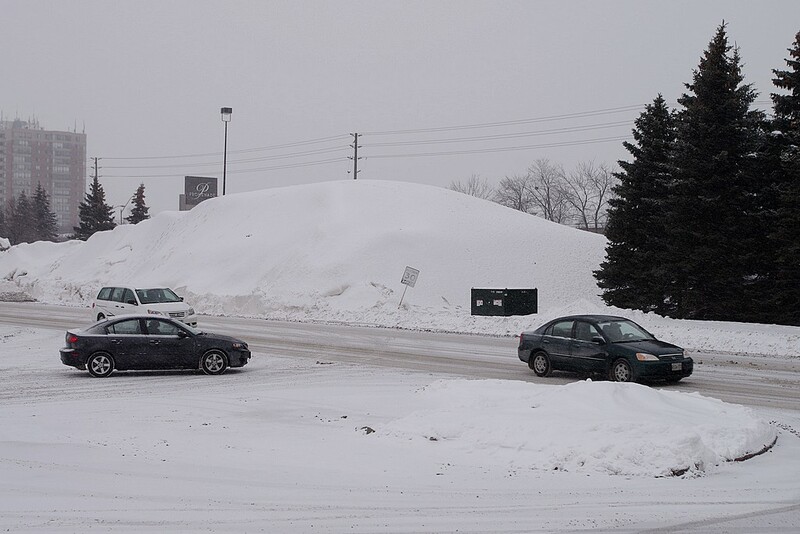 Boy, do these "parking lot piles" remind me of our days in Michigan! Those things can start to look pretty dingy after a while, and they tended to last for what seemed like months. We've been complaining about a gray, "cold" winter this year in our area; your shots put things back in perspective. between you and Tom that is the most snow I have ever seen in my life, reminds me why I stay south, way south. The remaining snow piles in May are called "sneaky snow" up here. Glaciers begin with unmelted snow. 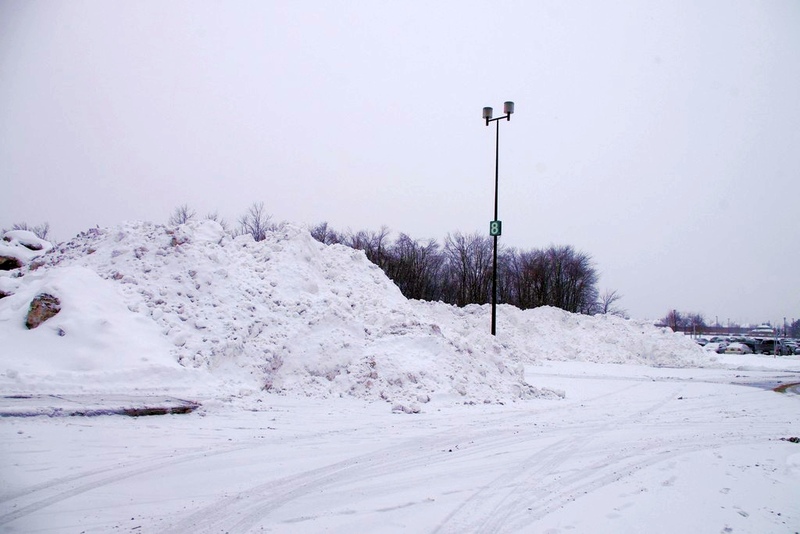 Parking lot piles usually remain for,a very, very long time. Good luck, and may the golf courses open in March! Except I've experienced exiting an over air conditioned van onto black pavement in Atlanta in August with the feeling of my leg hairs being singed off. Call it upbringing, but I'd rather freeze that fry. At least I have the option of putting on layers to warm up, but when it is really hot and there's no A/C, you roast. On the flip side, a couple of years ago we had a really early thaw and unusually warm late winter. It was warm enough that most of the apple trees started to bud, and then when the end of winter freeze hit, it killed off most of the crop. I guess the best to hope for is for everything to happen in the right time and place. I lived in Georgia for twenty years, and I never got used to the wet heat there. Then, I moved to Arizona. It's hotter, sure, but at least sweating actually works. I was amazed at how quickly I got used to it. I rode my bike to and from work all summer last year, even when it was 118°. I like it a lot better than 90° and humid. Just don't forget the water. People kid about Arizona being a dry heat, but it does make a huge difference. I had the opposite experience - spent 5 weeks in Israel through much of a heat wave. Came back to Toronto also still pretty hot. Main difference was I wasn't sweating away all that extra water I was drinking, and, well, had to interrupt my walk downtown every half hour or so.